Original Light Beer, Miller Lite, wants you to drink responsibly and to do so, they are bringing back the Designated Driver Sweepstakes in 2017. 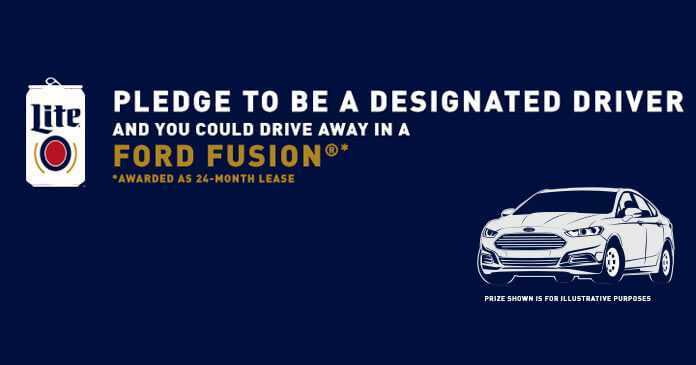 This year, you could win a 2017 Ford Fusion SE, awarded as a 2-year lease. All you have to do is take the pledge of always use a designated driver or take a cab, bus or train and commit to getting home safely. To take the Designated Driver Pledge, simply visit MillerLiteResponsibility.com now through November 7th then fill out the form by providing your email address. Once completed, hit the “Continue” button to access the sweepstakes entry form. Finally, follow the instructions to register and submit as directed to be entered into this annual Miller Lite Sweepstakes. Upon completion and submission of the registration form, you will receive one entry into the Sweepstakes. The Miller Lite 2017 Designated Driver Sweepstakes is offered only to legal residents of the 50 United States (including the District of Columbia) who are at least 21 years old at the time of entry and hold a valid driver’s license. Begins at or about 12:00 PM CT on April 24, 2017, and ends at 11:59:59 PM CT on November 3, 2017. A participant may receive only one entry per day during the Sweepstakes Period. On or about November 6, 2017, one potential winner will be randomly selected from all eligible entries received during the Sweepstakes Period. The Approximate Retail Value of the Prize is up to $14,920. Sponsored by MillerCoors LLC, 3939 W. Highland Blvd., Milwaukee, WI USA 53201. Administrated by Prize Logic, LLC, 25200 Telegraph Road, Suite 405, Southfield, MI USA 48033. For more information on this Miller Lite Sweepstakes, please read the official rules.